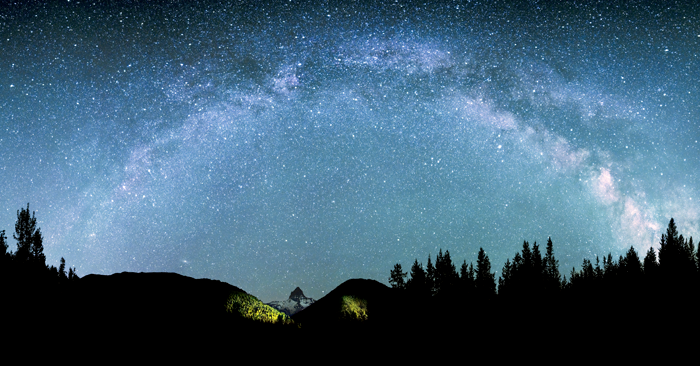 The Milky Way gracefully curves across the night sky over Glacier National Park. Photo copyright 2011 John Ashley. IDA announced today that it has recognized the Waterton-Glacier International Peace Park (W-GIPP) as a Provisional International Dark Sky Park. It is the first designation in the history of IDA’s International Dark Sky Places Program that spans an international boundary. The outcome caps a decade of effort undertaken jointly by the two national parks seeking IDA status. The new International Dark Sky Park consists of Waterton Lakes National Park in Alberta, Canada, and Glacier National Park in Montana, U.S. The two parks are contiguous, separated only by the U.S.-Canada boundary. In honor of the longstanding friendship between the two countries, the parks shared the distinction of being named the world’s first International Peace Park in 1932. Parks Canada and the U.S. National Parks Service collaborated on the application for this distinction, in keeping with the peace park’s tradition of cooperation. The W-GIPP’s new designation demonstrates that the park meets the sky quality and outreach requirements of IDA International Dark Sky Parks. The Peace Park promotes responsible outdoor lighting, improves the nighttime environment for wildlife, protects dark observing sites for astronomy and provides accessible locations for the public to experience naturally dark and exceptionally starry night skies. To achieve the designation, each park completed a significant number of lighting improvements to reduce light pollution. The provisional designation means that the two parks will have three years to retrofit their remaining non-compliant lighting fixtures. Parks Canada is installing dark sky-compliant lighting in the Waterton Community and others areas in Waterton Lakes National Park as part of infrastructure projects over the next three years. New development permits in the park also require that lighting be dark sky-compliant. For visitors, Parks Canada offers dark sky theatre programs and stargazing through telescopes at special events, led by staff and volunteer astronomers. Similarly, Glacier National Park is working steadily to improving the dark-sky friendliness of its outdoor lighting. The park received significant philanthropic support from the Glacier National Park Conservancy to complete the lighting inventory required in the application process, and to begin retrofitting its lighting fixtures. The Conservancy will kick off a campaign this summer to raise funds for the remainder of the needed improvements that must be completed by 2019. As part of the application, the City of Columbia Falls, Montana; the City of Whitefish, Montana; the Waterton Natural History Association; the University of Redlands, California; and members of the Big Sky Astronomy Club wrote letters of support.